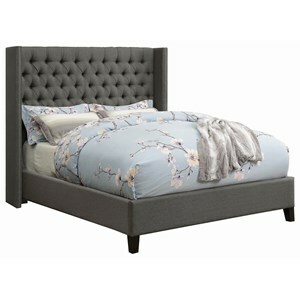 Nailhead trim provides a beautiful contrast to the dark grey fabric in this transitional style full bed. The upholstered bed shows off a headboard with crown inspired design while the footboard and rails offer a more modern look to the piece. The Zaira Transitional Full Upholstered Bed with Nailhead Trim by Homelegance at Value City Furniture in the New Jersey, NJ, Staten Island, Hoboken area. Product availability may vary. Contact us for the most current availability on this product. 1885FN-2 Full Footboard 1 59.5" 2"
1885FN-1 Full Headboard 1 59.5" 3.5" 52"
Browse other items in the Zaira collection from Value City Furniture in the New Jersey, NJ, Staten Island, Hoboken area.